Minipan proposes three production lines for baked goods: Gresex, Syr-Coex, Comby Plus 800. In the picture, the Gresex line, a fully automatic line with in-line refiner, suitable for producing up to 300 kg/h of bread-snacks and special breads. SYR-Coex is suitable for the production of a wide variety of extruded snacks and cookies as well as gluten-free products, including pizza bases. 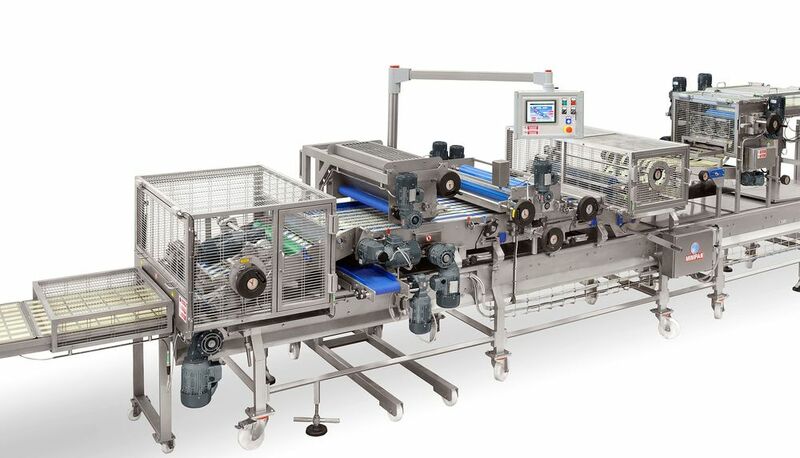 The line is equipped with a new automatic dough loading unit and a special pump with double scroll designed for feeding particularly anhydrous fruit-based pastes into a co-extrusion mould, for the production of filled biscuits. The depositor Comby Plus 800, featuring a special pan loading system, is ideal for the production of cookies with a high inclusion rate. The design of this new category of depositor and wirecut machines for biscuits and gluten-free products ensures easy sanitation. In fact the extrusion head and all electric parts are removable for easy maintenance. All movements are servo-assisted.